Counselor vs. Councilor – What’s the Difference? Home » Counselor vs. Councilor – What’s the Difference? In English, words that sound alike when spoken aloud but also have different meanings are called homophones. Councilor and counselor are great examples because even though most speakers pronounce them to be identical, their meanings never overlap in any contexts. If there were a council of counselors, members could be both a councilor and a counselor at the same time. Still, the words themselves refer to different roles, and it is important to use each in its proper context. If your marriage were failing, you would probably not want to see a councilor, and if your city has declared bankruptcy, you would probably not want to appoint counselors to run it. Continue reading to learn more about the difference between councilor and counselor, and how to use each correctly. What is the Difference Between Counselor and Councilor? 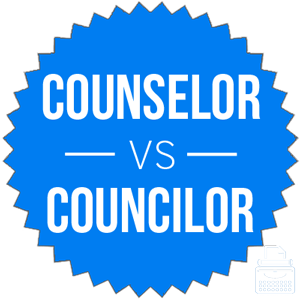 In this post, I will compare councilor vs. counselor. I will use each of these words in at least one example sentence, so you can see them in context. Plus, I will show you a helpful memory tool that will allow you to choose councilor or counselor correctly every time. What does counselor mean? Counselor is a noun. It means one who provides guidance, especially in an academic or therapeutic setting. Quite simply, then, a counselor is someone who counsels. The examples below show counselor in a sentence. Addie visited a guidance counselor because she couldn’t decide whether or not to attend college after graduation. My counselor says I have a habit of internalizing the disappointment in me I perceive in others and focusing on it until I become depressed. Counselor can be pluralized to counselors. Counselor and councilor have root words that are also homophones (counsel and council, respectively). Interestingly, these English homophones are derived from a pair of Anglo-French homophones, which were themselves derived from a pair of Latin homophones. Apparently, council and counsel have been confusing in several languages for several hundred years. What does councilor mean? The simplest definition of councilor is a member of a council. A council is a group of people who hold formal meetings to manage something or make decisions. A city council, for instance, is a group of people in charge of a city. A councilor would be a member of such a group. All councilors except one were present at this week’s city council meeting. Councilor Phillips will step down from his post to spend more time with his family. Councilor is a noun. Its plural form is councilors. Now, let’s go over a trick to remember counselor vs. councilor. A counselor is someone who gives guidance. A councilor sits on a deliberative body. Since counsel and therapy each contain the letter E, you should always be able to remember that a counselor gives guidance or therapy. Is it counselor or councilor? Counselor and councilor are two English homophones. A counselor is a person who gives guidance or therapy. A councilor is a member of a group that makes decisions. The two words are never interchangeable, despite being pronounced identically by many speakers. 1 What is the Difference Between Counselor and Councilor? Coca vs. Cocoa – What’s the Difference? Ladder or Latter – What’s the Difference?